Status epilepticus is a progressive and often lethal human disorder characterized by continuous or rapidly repeating seizures. Deficits in the functional expression of GABA (A) receptors are of major significance in the pathology of status epilepticus . Little is known about the mechanisms that terminate seizure activity and prevent the development of status epilepticus. Seizure initiation and termination are governed by complex synaptic regulation of neuronal excitability [2,3]. Several molecules including genes containing cAMP response elements (CREs) in their promoters have been identified that contribute to the development of epilepsy. Mice with decreased cAMP-response elementbinding protein (CREB) levels have a ~50% reduction in spontaneous seizures following pilocarpine induced status epilepticus and require more stimulation to electrically kindle. Altering CREB activity following a neurologic insult provides a therapeutic strategy for modifying epileptogenesis . GABA (A) receptors play important roles in the mechanism underlying the epileptogenesis. GABA (A) receptors assemble from five subunits, the composition of which determines the receptors functional and pharmacological properties and the specific location on the neuronal membrane [5,6]. The enrichment of GABA (A) receptors in sub-cellular compartments such as the axon initial segment has been reported for the α1 subunit which is found at the synapse in dendrites, a minority of GABA (A) receptors in the axon initial segment contain the α1 subunit [7,8]. The cell surface expression of α1-containing GABA (A) receptors that is dependent upon the formation of CREB heterodimers . GABA (A) receptors containing the γ2 subunit mediate synaptic transmission, and the γ2 subunit is required for benzodiazepine binding . It also affects the kinetics and conductance of GABA (A) R channels  and is required for postsynaptic clustering  and synaptic maintenance . Mutations in the gene encoding the γ2 subunit have been associated with generalized epilepsy syndromes including febrile seizures and generalized epilepsy with febrile seizures plus . Mutations in the δ subunit of GABA (A) receptors have been mapped in human epilepsy patients . Increased δ subunit level during diestrus stage of ovarian cycle has been associated with less seizure activities in kainic acid-induced epilepsy models . Low Mg2+ model of epilepsy is commonly used in experimental research [17-19]. Cultured hippocampal neurons under low Mg2+ display spontaneous recurrent epileptic discharges after a 3-h exposure to Mg2+-free solution . However, GABA (A) a receptor subunit alterations and its modulation mechanism in the low Mg2+ model of epilepsy remain elusive. Previously published studies demonstrated that the GABAa subunit α1 contains the cAMP response element(CRE) in their promoters . The GABA (A) receptors are the target gene of the CREB modulation [22,23]. Surface expression of GABA (A) receptors is transcriptionally controlled by the interplay of the CREB . However, the GABA (A) receptors subunit changes and their correlation with the CREB protein under low Mg2+ condition remain incompletely understood. The present study was designed to investigate the GABA (A) subunit changes by utilizing the low Mg2+ model of epilepsy in cultured hippocampal rat neurons. A total of 36 embryonic day 16 (E16) SD rats prepared from adult female SD rats at the age of 90-100 days (provided by the Experimental Animal Centre of Guizhou Medical University) were used as subjects in experiment. The adult rats weighed 350- 400g. They were individually housed in galvanized wire mesh cages with free access to food and water. Laboratory room temperature ranged from 21 to 25°C, and there was natural lighting. The reagents used in this study included the following: Recombinant Lentivirus (Shanghai Genechem Co., Ltd, China), Accutase Enzyme Cell Detachment Medium(Sigma, Santiago, USA), Neurobasal medium (Gibco, New York, USA), B27 (Gibco, New York, USA), Double resistance (penicillin streptomycin) (Gibco, New York, USA), GlutaMAX™ Supplemen (Gibco, New York, USA), Poly-L-lysine (Sigma, St. Louis, Missouri, USA), FBS (Gibco, New York, USA); TRIZOL reagent (Invitrogen, California, USA), Chloroform(Provided by the laboratory);The isopropyl alcohol and 100% ethanol (Tianjin kermel chemical reagent co., Ltd. China) ,No RNA enzyme water (Beijing solarbio science & technology co., Ltd. China); Specific primers (Sangon Biotech shanghai Co, Ltd. China), Maxima SYBR Green/ROX Qpcr Master Mix(2×) (K0221;Thermo Scientific, Grand Island, USA); ENO2/NSE antibody (Wuhan Boster Biological Technology Co., Ltd. China),Biotin-Goat Anti-Rabbit lgG (Wuhan Boster Biological Technology Co., Ltd. China), SABC three-step kit((Wuhan Boster Biological Technology Co., Ltd. China); SDS-PAGEGel Preparation Kit (Beyotime Biotechnology, shanghai, China), Immobilon Western HRP (Millipore, Massachusetts, USA), anti-GABAa Rα1 (Abcam, Cambridge, United Kingdom), anti-CREB (Gene Tex, Southern California, USA). Biosafety cabinet (Nuaire, USA), CO2 constant temperature incubator (Thermo Electron Corporation USA), Inverted phase contrast microscope (Leica, Germany), Inverted fluorescence microscope, NanoDropTM 200°C Spectrophotometer (Thermo scientific, USA), Life VIIATM7 (Thermo Scientific, USA), Gel Document System (Bio-Rad), Circulating Water Bath (Ferrotec Corporation, Japan). (1) Physiological bath recording solution were prepared without Mg2+ but 2 μM glycine (126 mM NaCl, 24 mM NaHCO3,10mM D-Glucose, 2.5 mM KCL, 2 mM CaCl2, 1mM NaH2PO4, 5 mM sodium pyruvate, 2 μM glycine),which were named pBRS(+ low Mg2+). (2)Physiological bath recording solution were prepared containing Mg2+ (126 mM NaCl, 24 mM NaHCO3,10mM D-Glucose, 2.5 mM KCL, 2 mM CaCl2,1mM,NaH2PO4, 5 mM sodium pyruvate, 2 μM glycine,1mM MgCl2,), which were named pBRS(-low Mg2+). The experimental subjects were provided by the Experimental Animal Centre of Guizhou Medcial University. All the experiments procedures were approved by the Ethic Committee of Guizhou Medcial University. All efforts were made to minimize animal suffering and to reduce the number of animals used. Primary rat hippocampal cultures were prepared from E16 embryos rats as following described. Hippocampi of the embryos rats were disrupted both mechanically and enzymatically. For enzymatic disruption, Accutase (Sigma) were added and hippocampi were then incubated at 37 °C for 10 min. Hippocampi were maintained in serum free Neurobasal medium (Gibco) supplemented with 2% B27 (Gibco), double resistance (penicillin streptomycin) (Gibco) and GlutaMAX™ Supplemen (Gibco). Neurons were plated onto 0.33 mg/mL poly-L-lysine- (Sigma) treated glass coverslips at a density of 7× 105 cells per 34-mm culture dish for RNA isolation experiments; and 5× 105 cells per 18-mm glass coverslip for immunofluorescence analysis. Cultures were maintained at 37°C under 5% CO2. The hippocampal neurons used for identification were incubated for 7 days. The cells were fixed by 4% paraformaldehyde for 30 min. Fixed cells were oxidized by 0.3% H2O2 (diluted by 80% Methanol) for 10 min. The cells were washed by PBST for 5 min, three times in all, incubated with normal goat serum for 30 min and then incubated overnight at 4°C with anti-NSE antibody (1:100). The specimen was incubated with the appropriate peroxidase-conjugated second antibody for 90 min at room temperature. After being washed, the specimen was incubated with streptavidin (labeled by HRP) for 90 min at room temperature. After that, specimen was developed by 0.05% DAB-0.03% H2O2, mounted by glycerin gelatin and observed in inverted phase contrast microscope. The cultured hippocampal neurons assigned to the following groups: control group, low Mg2+ treatment group (subdivided into three subgroups, including 3h, 6h, and 9h subgroup respectively). Each group included three samples with the same cell density, and one sample included neurons from three embryos rats (9 embryos rats were included in one group). A total of 36 embryos rats were used in the present study. To induce the model of epilepsy, aCSF without Mg2+ but 2 μM glycine (126 mM NaCl, 24 mM NaHCO3,10mM D-Glucose, 2.5 mM KCL, 2 mM CaCl2, 1mM NaH2PO4, 5 mM sodium pyruvate, 2 μM glycine) was used . The low Mg2+ model of epilepsy was generated in the neuronal cultures by exposing them for 3 h to a solution containing no added MgCl2 (low Mg2+) using procedures described previously [3,20,25,26]. Briefly, after the removal of maintenance media, neurons were gently washed with 3× 1.5 ml of pBRS (±1 mM MgCl2) and then allowed to incubate in this solution at 37°C under 5% CO2/95% air atmosphere. At the end of the 3 h period, low Mg2+ treatment was terminated by gently washing the neuronal cultures with 3× 1.5 ml of minimum essential medium, returned to the maintenance medium and incubated at 37℃ under 5% CO2/95% air atmosphere. Thus, low Mg2+ treatment was carried out with pBRS without added MgCl2, whereas some controls were treated with pBRS containing 1 mM MgCl2. Specific primers were purchased from Sangon (Sangon Biotech Co,Ltd. Shanghai, China). The sequences of the primers were as follows: CREBF: 5-CAGACAACCAGCAGAGTGGA-3’, C R E B - R : 5 - TACAGTGGGAGCAGATGACG3’;GABA-F: 5-ATCTCCGTGCTGAAGATGCC-3’, G A B A - R : 5 - ACTTCACAGACCGTAGACGC-3’; GABA(A) receptor α1-F： 5-GCGACCATAGAACCGAAAGA-3’, GABA(A) receptor α1-R：5- CCAAATAGCAGCGGAAAGG-3’; GABA (A) receptor γ2-F: 5-GTGTTTGGATGGCAAGGACT-3’, GABA (A) receptor γ2-R:5- AGAAGGCGGTAGGGAAGAAG-3’; GABA(A) receptor δ-F: 5-TCTTCTCCCTCTCTGCTGCT-3’, GABA(A) receptor δ-R: 5-TCCTTCTTTGCCTCCACTTC-3’. Rat ACTB Gene Assay (Beta-actin) (Sangon Biotech Co, Ltd. China) was used as reference for relative expression analysis in qRT-PCR. Total RNA was obtained from the cultured hippocampal neurons with trizol. RNA concentrations were measured using (NanoDrop 2000; Spectrophotometer). cDNA was generated from total RNA using a random hexamer primer and RevertAid First Strand cDNA Synthesis Kit (K1621;Thermo Scientific, USA) according to the manufacturer’s instructions. Expression analysis of the genes was performed by using (Life VIIATM7, Thermo Scientific). All reactions contained cDNA, Maxima SYBR Green/ROX Qpcr Master Mix (2×) (K0221; Thermo Scientific, USA), 3μM primer sets. PCR reactions were performed using the LIGHTCYCLER program, 95°C for 10 min followed by 40 cycles of 95°C for 15 s, 60°C for 60 s. Each primer set was standardized prior to use to obtain reaction efficiency values of 1.8- 2.2, allowing use of the ΔΔCT method in data analysis. The treated cells were washed with phosphate buffered saline (PBS) and lysed with 2× sample buffer. The samples were separated by 10% SDSPAGE gels. After electrophoresis, proteins were electrically transferred to PVDF membranes and blocked with the blocking liquid for 60 min at RT. The membranes were incubated overnight at 4 °C with the appropriate primary antibodies (anti- GABA (A) Rα1 1:2500, abcam; anti-phospho- CREB 1:3000, Cell Signaling Technology; anti- CREB 1:1000, Gene Tex). Membranes were washed three times with Tris-buffered saline containing 0.1%Tween20 (TBS-T) and then incubated with peroxidase conjugated secondary antibody for 2 h at RT. Blots were washed again with TBS–T for three times and detected by enhanced chemilumine- scence method (Amersham,Buckinghamshire, UK). Graphs were prepared and statistical analyses were performed using Graph Pad Prism version 6. All values are presented as mean ± standard error of the mean (SEM). Statistical significance was assessed by one-way ANOVA with Dunnett’s multiple comparisons test or by 2-tailed unpaired or paired t-test according to the type of analysis. The correlation analysis between the CREB and the GABA (A) receptors was performed by a nonparametric method. For all graphs, an asterisk (*) over a bar or over a bracket indicates a significant difference (*p<0.05, **p<0.01, ***p<0.001) compared with the control group. The neurons cultured for 7 days displayed large cell body and abundant cytoplasma Figure 1A. The NSE immunohistochemical staining was used to identify the cultured hippocampal neurons. The NSE immunoreactions complexes were shown as brown and in granulate. The positive NSE granulates were distributed in the cytoplasm and major nerve process, with the glias unstained (Figure1B). These results suggested that the cells to be identified are hippocampal neurons. Figure 1: Hippocampal neurons cultured for 7 days. 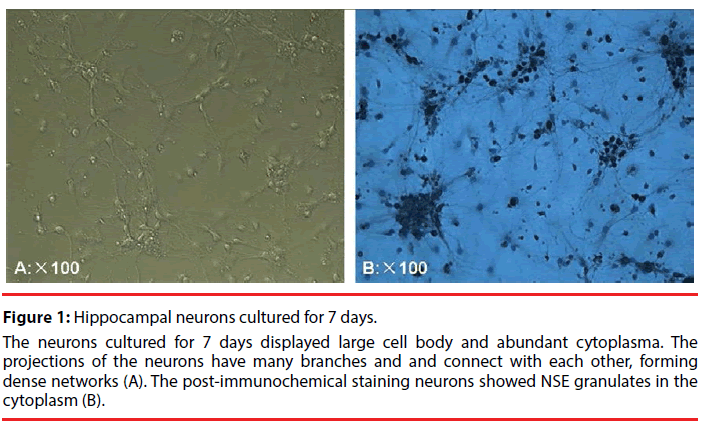 The neurons cultured for 7 days displayed large cell body and abundant cytoplasma. The projections of the neurons have many branches and and connect with each other, forming dense networks (A). The post-immunochemical staining neurons showed NSE granulates in the cytoplasm (B). After 7 days, cultures were utilized for experiment. Maintenance medium was replaced with pBRS with (the control group) or without MgCl2 (the treatment group). Induction of spontaneous recurrent epileptic discharges was performed following a 3-h exposure of hippocampal neuronal cultures to low Mg2+. Cultures were then harvested, and total mRNA were obtained from hippocampal pyramidal neurons respectively at 3h, 6h, 9h after a 3-h exposure to Mg2+-free solution in each treatment group. A marked increase in the expression levels of the neuronal GABA (A) receptors was observed at 3h after a 3-h exposure to Mg2+-free solution, which could account for an increase in hippocampal GABA-ergic inhibition during epileptiform activity. The CREB gene displayed a timedependent increase within 9 hours during our observation (Figure 2). Further, the correlation analysis was performed to observe the relationship between the CREB and the GABA (A) receptors. A high negative correlation was noted with a statistical significance (the correlation coefficient =0.95, Figure 3). Comparing CREB gene with GABA gene in the expression levels at different times, we speculated that the CREB regulate GABA expression in cultured hippocampal neurons under low Mg2+ conditions. Figure 2: Time-dependent changes of CREB and GABA(A) receptors during low Mg2+ stimulation. The CREB decreased 3 hours (3h time point) after exposing to the low Mg2+ condition compared to the control. It increased remarkably at 6h and 9h time point. However, the GABA(A) receptors increased significantly at 3h time point compared with the control, and decreased gradually in a time-dependent manner. A significant decrease in GABA(A)at the 9h time point was observed as compared with those in the 6h or 3h time point. Figure 3: Correlation between the CREB and the GABA changes. A negative correlation was observed between the CREB and the GABA receptor subunits. 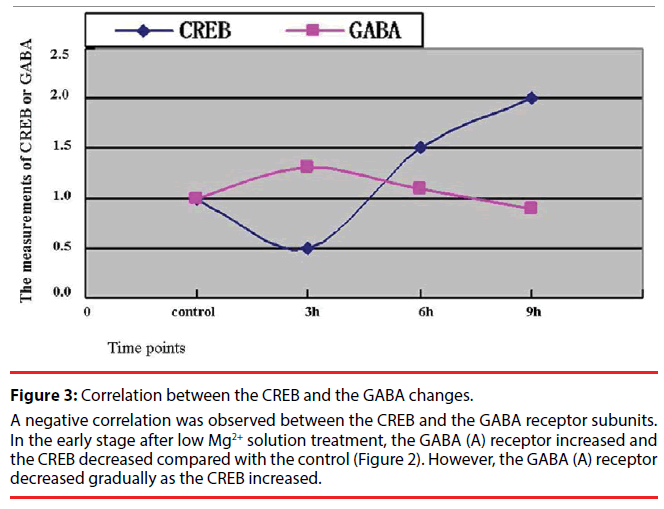 In the early stage after low Mg2+ solution treatment, the GABA (A) receptor increased and the CREB decreased compared with the control (Figure 2). However, the GABA (A) receptor decreased gradually as the CREB increased. In order to observe the GABA (A) receptor subunit increase in detail, we selected the 9h time point to quantify the GABA (A) receptors. The results showed that the hippocampal neurons perfused with low Mg2+ aCSF exhibited a significant increase of cellular GABA (A) receptor subunit α1, γ2, δ at 9h compared with the normal control. A significant difference in the increase of the GABA (A) receptor subunit α1, γ2, δ respectively was noted as compared to the control (Figure 4). 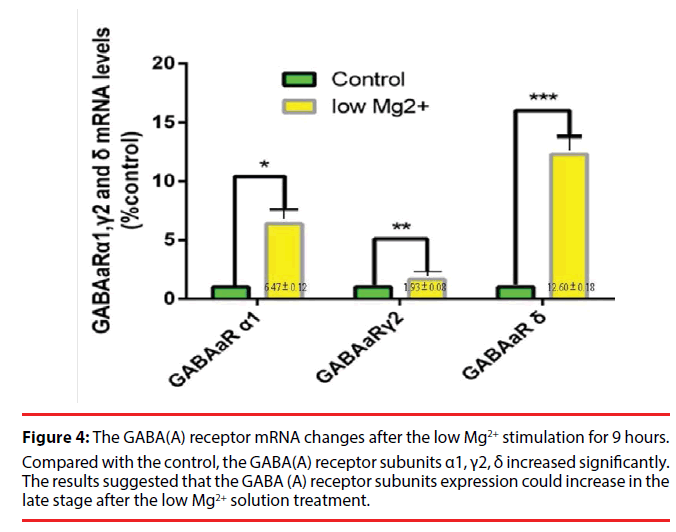 Figure 4: The GABA(A) receptor mRNA changes after the low Mg2+ stimulation for 9 hours. Compared with the control, the GABA(A) receptor subunits α1, γ2, δ increased significantly. The results suggested that the GABA (A) receptor subunits expression could increase in the late stage after the low Mg2+ solution treatment. At the 9h time point after the low Mg2+ solution treatment, a remarkable increase in the GABA (A) receptor subunit α1 protein was observed as compared to the normal control. The CREB protein also displayed similar results compared to the normal control. These results suggested that the low Mg2+ stimulation could increase the GABA (A) receptor expression as well as the CREB (Figure 5 A and Figure5 B). Figure 5: Low Mg2+ stimulation of cultured hippocampal neurons increased the GABA(A)receptor α1 and CREB protein expression. The GABA(A)receptor α1 protein increased significantly at the 9h time point as compared with the normal control(Figure5A), and the CREB protein expression also displayed a similar result (Figure 5B), suggesting that the low Mg2+ stimulation could promote the GABA(A)receptor α1 and the CREB expression. The low Mg2+ model of epilepsy is commonly used in experimental research [17-19]. Cultured hippocampal neurons under low Mg2+ display spontaneous recurrent epileptic discharges after a 3-h exposure to Mg2+-free solution . However, GABA (A) receptor subunit alterations and its modulation mechanism in the low Mg2+ model of epilepsy remain elusive. In the present study, we generated a low Mg2+ model of epilepsy by using the method provided by removal of Mg2+ from the extra-cellular medium of cultured hippocampal rat neurons . At 3, 6, 9h after 3h-low Mg2+ treatment, the neurons were harvested, and then CREB protein and GABA (A) receptors genes expression were detected by the qRT-PCR technique. The results demonstrated that the GABA (A) receptors increased at 3h time point, and then it displayed a time-dependent decrease. The CREB showed an inverse response. It decreased at the 3h time point compared to the control, and then it increased gradually in a time-dependent manner. The GABA (A) receptors decreased as the CREB increased, showing a negative correlative relationship. At the 9h time point, the GABA (A) subunit α1, γ2, δ increased remarkably compared to the 9h control. The CREB displayed a similar result. The GABA (A) receptors play important roles in epileptogenesis. It decreased in brain tissues of patients with pharmacoresistant epilepsy. They are targets for a variety of drugs including benzodiazepines, which are of high clinical relevance for the first-line antiepileptic drugs of status epilepticu. Therefore it is likely that the modulation of stability of GABA (A) receptors induces or supports benzodiazepine pharmacoresistance in patients with status epilepticus. A rapid modification of the postsynaptic GABA(A) receptor population leads to a widespread decline in GABA-mediated inhibition that, in part, contributes to both the self-sustaining nature of status epilepticus and to the decrease in the efficacy of benzodiazepines . The phosphorylated CREB (p-CREB) was highly expressed in both rats and patients with temporal lobe epilepsy as compared to controls , and the CREB decreased in the epileptic brain, suggesting that the process from CREB to p-CREB be enhanced. The CREB is associated with the epileptogenesis. Its decrease leads to a reduction of seizures. Recently published studies demonstrated that mice with decreased CREB levels have a ~50% reduction in spontaneous seizures following pilocarpineinduced status epilepticus and require more stimulation to electrically kindle . Altering CREB activity following a neurologic insult provides a therapeutic strategy for modifying epileptogenesis . The mechanisms that terminate seizure activity and prevent the development of status epilepticus remains poorly understood. The increase of GABA (A) receptor subunit α1, γ2, δ might be possible factors terminating the epileptic activity in the early stage of the status epilepticus. However, the GABA (A) receptors decreased gradually as the duration of seizures prolonged. GABAergic mechanisms fail and seizures become self-sustaining and pharmacoresistant. These results provide a potential mechanism for the inhibitory loss and for the pharmacoresistance to benzodiazepines, as a reduction of available functional GABA (A) postsynaptic receptors. Novel therapies for SE might be directed toward prevention or reversal of these losses . The GABA receptors are the target gene of the cAMP-response element-binding protein (CREB) modulation [22,23]. Surface expression of GABA (A) receptors is transcriptionally controlled by the interplay of the CREB . We speculated that the CREB regulate the GABA (A) receptor α1, γ2 and δ subunits expression in cultured hippocampal neurons. However, we were unable to use the neuro-physiological recording technique to confirm the success of the low Mg2+ model of epilepsy. We just observed the phenomenon that the GABAA receptor decreased as the CREB increased. We did not block the effect of the CREB. So the evidences of our conclusions are not sufficient enough. These are important limitations of the present study. Further studies are required to address such problems. The authors declared they have no any actual or potential conflict of interest including any financial, personal or other relationships with other people or organizations within three years of beginning the submitted work. This research was supported by the Natural Science Fund of China (81560222/ H0913，81241129/ H0913) and Program for Changjiang Scholars and Innovative Research Team in University (IRT10358). We are grateful for the real-time PCR technical help provided by Sangong Biotech (Shanghai, China) Co., Ltd. We are also indebted to the Guizhou Centre for Disease Control and Prevention for providing us with the laboratory platform. We also wish to thank all the postgraduates involved for their hard work during the study. Terunuma M, Xu J, Vithlani M, et al. Deficits in phosphorylation of GABA(A) receptors by intimately associated protein kinase C activity underlie compromised synaptic inhibition during status epilepticus. J. Neurosci 28(2), 376-384 (2008). Lothman EW, Bertram EH 3rd, Stringer JL. Functional anatomy of hippocampal seizures. Prog. Neurobiol 37(1), 01-82 (1991). Delorenzo RJ, Sun DA, Deshpande LS. Cellular mechanisms underlying acquired epilepsy: the calcium hypothesis of the induction and maintainance of epilepsy. Pharmacol. Ther 105(3), 229-266 (2005). Jacob TC, Moss SJ, Jurd R. GABA(A) receptor trafficking and its role in the dynamic modulation of neuronal inhibition. Nat. Rev. Neurosci 9(5), 331-343 (2008). Luscher B, Fuchs T, Kilpatrick CL. GABAA receptor trafficking-mediated plasticity of inhibitory synapses. Neuron 70(3), 385-409 (2011). Panzanelli P, Gunn BG, Schlatter MC, et al. Distinct mechanisms regulate GABAA receptor and gephyrin clustering at perisomatic and axo-axonic synapses on CA1 pyramidal cells. J. Physiol 589(20), 4959-4980 (2011). Brunig I, Scotti E, Sidler C, et al. Intact sorting, targeting, and clustering of gamma-aminobutyric acid A receptor subtypes in hippocampal neurons in vitro. J. Comp. Neurol 443(1), 43-55 (2002). Mohler H. Pathophysiological aspects of diversity in neuronal inhibition: new benzodiazepine pharmacology. Dialogues. Clin. Neurosci 4(3), 261-269 (2002). Gunther U, Benson J, Benke D, et al. Benzodiazepine-insensitive mice generated by targeted disruption of the gamma 2 subunit gene of gamma-aminobutyric acid type A receptors. Proc. Natl. Acad. Sci. U S A 92(17), 7749-7753 (1995). Essrich C, Lorez M, Benson JA, et al. Postsynaptic clustering of major GABAA receptor subtypes requires the gamma 2 subunit and gephyrin. Nat. Neurosci 1(7), 563-571 (1998). Schweizer C, Balsiger S, Bluethmann H, et al. The gamma 2 subunit of GABA(A) receptors is required for maintenance of receptors at mature synapses. Mol. Cell. Neurosci 24(2), 442-450 (2003). Macdonald RL, Kang JQ, Gallagher MJ. Mutations in GABAA receptor subunits associated with genetic epilepsies. J. Physiol 588(1), 1861-1869 (2010). Feng HJ, Kang JQ, Song L, et al. Delta subunit susceptibility variants E177A and R220H associated with complex epilepsy alter channel gating and surface expression of alpha4beta2delta GABAA receptors. J. Neurosci 26(5), 1499-1506 (2006). Maguire JL, Stell BM, Rafizadeh M, et al. Ovarian cycle-linked changes in GABA (A) receptors mediating tonic inhibition alters seizure susceptibility and anxiety. Nat. Neurosci 8(1), 797-804 (2005). Armand V, Gabriel S, Hoffmann P, et al. Epileptiform activity and changes in field potential responses induced by low [Mg2+]0 in a genetic rat model of absence epilepsy. Brain. Res 803(1-2), 19-26 (1998). Kang EE, Zalay OC, Cotic M, et al. Transformation of neuronal modes associated with low-Mg2+/high-K+ conditions in an in vitro model of epilepsy. J. Biol. Phys 36(1), 95-107 (2010). Lasztoczi B, Antal K, Nyikos L, et al. High-frequency synaptic input contributes to seizure initiation in the low-[Mg2+] model of epilepsy. Eur. J. Neurosci 19(5), 1361-1372 (2004). Deshpande LS, Lou JK, Mian A, et al. In vitro status epilepticus but not spontaneous recurrent seizures cause cell death in cultured hippocampal neurons. Epilepsy. Res 75(2-3), 171-179 (2007). Blair RE, Sombati S, Lawrence DC, et al. Epileptogenesis causes acute and chronic increases in GABAA receptor endocytosis that contributes to the induction and maintenance of seizures in the hippocampal culture model of acquired epilepsy. J. Pharmacol. Exp. Ther 310(3), 871-880 (2004). Blair RE, Deshpande LS, Sombati S, et al. Activation of the cannabinoid type-1 receptor mediates the anticonvulsant properties of cannabinoids in the hippocampal neuronal culture models of acquired epilepsy and status epilepticus. J. Pharmacol. Exp. Ther 317(3), 1072-1078 (2006). Sombati S, Delorenzo RJ. Recurrent spontaneous seizure activity in hippocampal neuronal networks in culture. J. Neurophysiol 73(4), 1706-1711 (1995). Sun HY, Goodkin HP. The pervasive reduction of GABA-mediated synaptic inhibition of principal neurons in the hippocampus during status epilepticus. Epilepsy. Res 119(1), 30-33 (2015). Naylor DE, Liu H, Wasterlain CG. Trafficking of GABA(A) receptors, loss of inhibition, and a mechanism for pharmacoresistance in status epilepticus. J. Neurosci 25(34), 7724-7733 (2005).